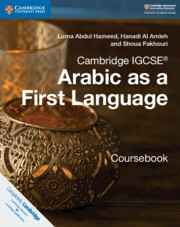 Our Arabic resources cover the Cambridge IGCSE® curriculum for students learning Arabic as a first language. Students learning Arabic will gain a deeper understanding of grammar, spelling and punctuation, as well as diverse vocabulary, empowering them with greater confidence using the Arabic language. Discover our selection of Arabic teaching resources today. Learning Arabic with Cambridge University Press will not only empower students to develop a greater understanding of the language, but also develops other skills they can apply outside the classroom. Through engaging activities and texts, students can improve their critical thinking skills – which will come in handy later for career opportunities after education. Through studying the Arabic language with Cambridge University Press, students will discover the intricacies of another dialect that adopts a different alphabet. With a selection of exam style questions, and a learning objective promoting self assessment, we encourage students to get as much exam practice as they can. If you’d like more information about choosing the right Arabic teaching resources for your students, to help them prepare for their exams, contact your local sales representative for more information.